This is a rerun of the big noise made in the town hall on the stadium issue. Can now see the need for cycle ways. On ya bike Dave. So long as the Highway cycleway that magics him off to Tarras for good, also deletes itself soon as the last vestige of his tail feathers are out of view. Looking up the backside of an Ostrich is repugnant. If the mayor was playing golf the South Dunedin flood would be his worst water hazard ever. He should resign right now. Ray, talk about floods in South Dunedin. I see that South Dunedin is to get another kick in the guts, with the cycleway money being transferred out Portobello way. Why couldn’t the money be diverted to stormwater infrastructure. Not only to Portobello Rd but also to central city cycleways before the NZTA subsidies dry up. While South Dunedin gets a drownable hockey turf. Where is it that Dave of the gilded bicycle chain lives? 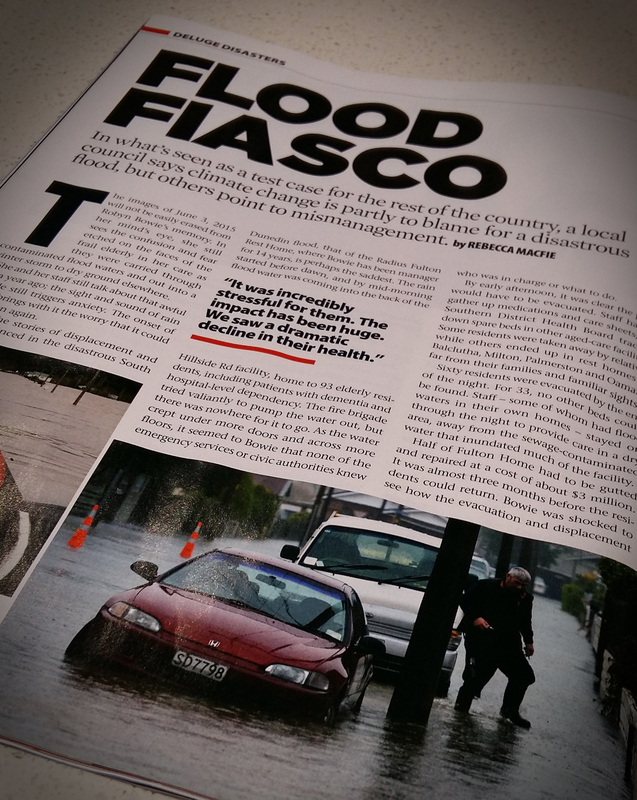 It is a good article and it will be fascinating to see what elected DCC officials turn up next Monday week at the second Public Meeting called by Clare Curran MP on the South Dunedin flooding. What worries me now is despite the wise decision to defer any more South Dunedin cycleways (apart from fixing Portobello Rd) the money saved is being channelled towards the Central Business District as part of the DCC’s planned $37M “upgrade”. Waiting in the wings is another pet project, namely the Harbourside Development which will also cost us big time. Meantime residents and ratepayers wait patiently for the DCC to spend money on South Dunedin infrastructure to minimise future flooding. Unless there’s an independent chairperson at that South Dunedin Public Meeting on the evening of 20 June (time and venue details to come) who is well grounded in meeting procedure – the meeting will be a lost cause. Maybe they don’t like being called a strong and independent voice of the city and region. 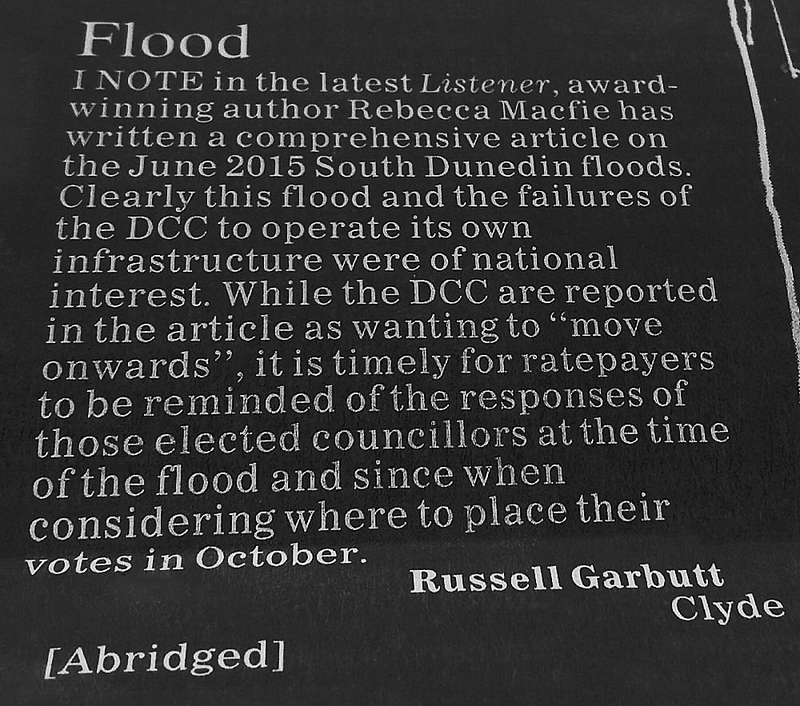 Why else would they abridge Russell’s letter. Dunedin constituents might like to remember…. Businesses grumbling about accountability might like to remember the Pike River disaster. Opinion: Someone called Legal Reasons has all the excuses. I didn’t ask for a reference when I finished at Kentucky Fried Chicken because in my three weeks there I managed to break an expensive set of scales and they thought I was a spy. I wasn’t a spy. But I was still working for Homestead Chicken on the side, after I’d promised not to. And what normal person reads the staff noticeboard on their tea break? Open and shut case, no doubt about it. Also – and here they had a point – how unbelievably stupid do you have to be to let an expensive set of scales get shaken off the edge of a twenty foot bench by the vibrating flour bin? I didn’t ask for a reference as I pulled on my helmet, and they didn’t offer me one. But most people earn it, and when they finish up, the boss hands them a nice letter. At least that’s how it used to work. A young man I know has had a job for the past nine years making spectacle lenses. But a couple of months ago, the company shut down that part of their business. Not a huge surprise. Happens all the time these days. One minute you think you’re making steel for a world-class state-of-the-art iconic bleeding-edge Auckland international convention centre, the next thing they’ve ordered it from Thailand. Kia ora. But they did their job perfectly well! What’s the problem? “Something something liability something,” apparently. Perhaps we could blame the lawyers, being all super-cautious about everything all the time. But should we? There’s a business frame of mind that only hears the part of their lawyers’ advice they want to hear, then tells the world “My lawyer said I can’t” when in fact the lawyer only told them “be careful”. Many businesses today come in two unpleasant flavours – full of swaggering pride about their vital importance to the world and/or lawyered up to a fault. Both of those flavours seem to make them incapable of ever admitting they’re wrong about anything. Ever. Company directors have been grumbling lately about law changes that make them more accountable. Big personal liability! Huge fines! Jail! Stuff that for a game of soldiers, eh? But if you’ve read Rebecca Macfie’s astonishing account of the mismanagement that preceded the Pike River disaster (Tragedy at Pike River Mine – Awa Press) you may see things differently. You may think some stronger controls and greater accountability might make some people behave a little more carefully, a little more wisely, a little better. ….Everyone gets things wrong, but this sharp-elbowed world is full of people who struggle to accept that. In a city like Dunedin they gave names like….. Comment received. Martin Legge January 14, 2013 at 8:57 am Spare a thought for all the Pike River victims and their families….. Unless there’s an independent chairperson at that South Dunedin Public Meeting on the evening of 20 June (time and venue details to come), who is well grounded in meeting procedure – the meeting will be a lost cause. Could the South Dunedin Action Group (Hi Ray) please ask Stan Rodger in for that task or someone clearly with similar stature and expertise. Yes, someone who “is well grounded in meeting procedure” and has mature self-control, and doesn’t call people liars during and after the meeting, particularly when there is not a shred of evidence to support the allegation. The “council” is appearing at the meeting – which council politicians, and which staff officials is unclear. Don’t forget that this is election year. A good chance for those who will lose their safe ward seats to lift their profile. Been there done nothing. If Cull’s ‘Council taking flooding seriously’ on last Friday’s ODT Opinion page is anything to go by, the meeting will be simply “no fault here, time to move on”, from councillors. Cull makes it plain that as far as he is concerned, it was high ground water combined with an extreme rain event. He then reiterates the Climate Change crap and sea levels rising, neither of which was fact. That suggests he is in serious denial. Hype O’Thermia, you made a good point over here (those comments are now closed). pipes can build up over time and become rock hard with the result that the pipe flow becomes restricted. The South Dunedin ICMP (2011) mentions this, it says (page 68): Failure to remove silt and gravel from the catchpits can also lead to siltation and hence capacity reduction of the pipe network; siltation has been identified as an issue in some areas of Dunedin by the Network Management and Maintenance team, and this is currently being investigated as part of a city-wide CCTV (closed circuit television) programme. I don’t know if it is practical to clear out the hardened silt, but this will be expensive, especially if the only solution is to completely replace the affected pipes. No doubt the mud-tank maintenance failure was a cost-cutting measure – but this could now have become an extremely costly cost-cutting measure, an example of very short-term thinking, in an organization infested with the religion of Sustainability.